It seems as though we can't move an inch on Instagram without being confronted by a sequinned skirt. Apparently, the fashion crowd are forgoing the traditional party dress this season in favour of "look at me" sequin-covered numbers, and we are so here for it. It comes as no surprise that Zara is at the front line of the action, delivering a number of disco ball–inspired midi styles that were made to hit the dance floor. These are, however, not your typical sequinned skirts. While most high-street stores have opted for classic silver and gold, Zara has gone off-piste with three statement-making styles that stand out from the crowd: one in check, a second in animal print and a third in oversized, fire-engine red sequins. The overall effect is seriously high-end. From Laura Jackson to Ada Oguntodu, there are plenty of stylish individuals who have embraced the trend. 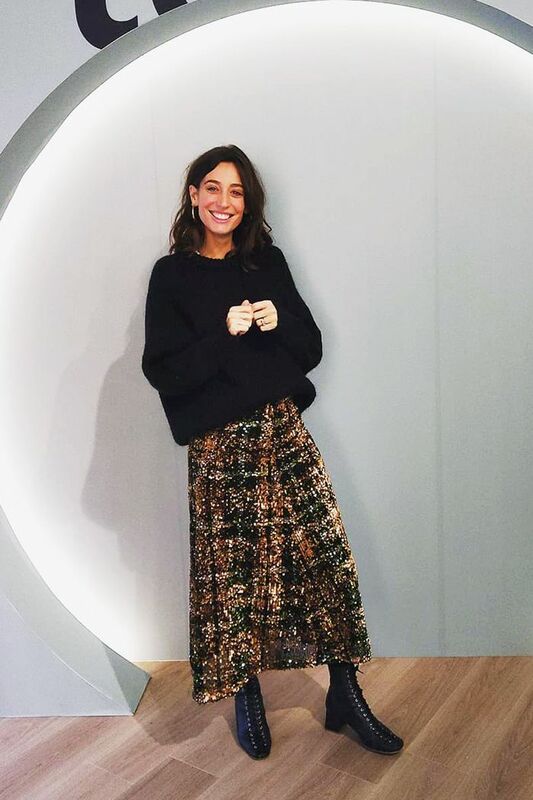 Interestingly, they have all decided to style their skirts with chunky knits, so it's clear that dressing down with casual staples is the key to making this look work. We'll be wearing ours to our Christmas party with a white tee, kitten heels and plenty of attitude. Scroll down to see the Zara skirts everyone is talking about. Style Notes: Laura Jackson packs all our favourite autumn/winter trends into one stunning outfit. While a normal checked skirt would've sufficed, a scattering of sequins elevates the print to new heights. Style Notes: We fell in love with this red midi the moment we saw it in the Zara showroom. Packing plenty of Jessica Rabbit vibes, the oversized, matte-effect sequins and midi length make it look like it belongs in a designer boutique. Style Notes: Zara gives leopard print the party treatment with this ankle-grazing showstopper. We'll be taking our cues from Monikh, who styles hers with a cream chunky knit and mock-croc accessories. This will look good with everything from white tees to sheer black blouses. Christmas party, here we come. Make like a mermaid with Mango's teal sequins. Go for head-to-toe black with this Ganni number. The slits on this Topshop midi are great for elongating the leg. An affordable and versatile look.